‘It’s a book about enjoying, not dreading retirement. And yes, it’s about stopping - stopping, at long last, to smell the roses. We’ve done just that.’ This is the much-honoured educator and priest Theodore M. Hesburgh introducing the diary of his travels, with Ned Joyce, round the world. Ted, as he was known, was president the University of Notre Dame for 35 years, and Ned was his vice-president for the same period - a period during which Notre Dame became one of the top universities in the United States. 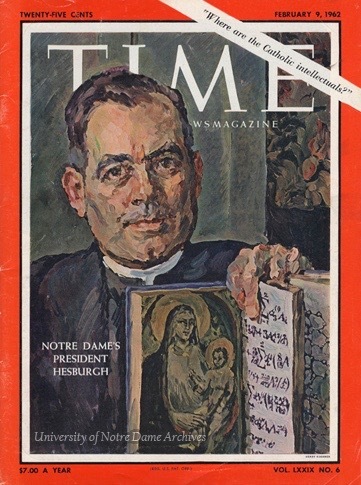 Hesburgh was born in Syracuse, New York on 25 May 1917. After finishing high school, he entered the Holy Cross seminary on the University of Notre Dame campus, in the very north of Indiana state. He was sent to Rome to study for advanced degrees in philosophy and theology, but with the start of the Second World War he returned to the United States where he was ordained at Notre Dame in 1943. He studied for his doctorate in sacred theology at the Catholic University of America in Washington D. C.. Subsequently, he was sent back to Notre Dame to teach naval officers under wartime training, and to serve as chaplain to returning veterans. In 1948, Hesburgh became head of the department of theology at Notre Dame; and the following year he was named as executive vice-president. From 1952, he was the university’s president, serving for 35 years in that capacity (with vice-president Ned Joyce, also a priest, serving the same long term) and having the most profound and long-lasting positive impact on the university’s growth and status. For example, he liberalised the rules of student life, promoted academic freedom, helped make Notre Dame one of the top universities in the country, doubling its enrolment and greatly increasing its funds. He was also responsible for overseeing the admittance of women students, and for transferring its governance from the Holy Cross to a mixed lay and religious board. But Hesburgh played a much wider role in public affairs, holding more than a dozen appointments to bodies such as the National Science Foundation, the Civil Rights Commission, the Select Commission on Immigration and Refugee Policy, and the Overseas Development Council. He was a key figure in the student movement against the Vietnam war, and for 15 years served as the permanent Vatican representative to the International Atomic Energy Agency. In 1964, he was awarded the Medal of Freedom, the nation’s highest honour, by President Lyndon Johnson. After retirement from Notre Dame, he continued to serve on public bodies, and received many public honours - indeed he holds the Guinness Book of World Records title for largest number of honorary degrees, having been awarded 150 (all are listed in his Wikipedia entry!). He died in 2015. Further biographical information is available online thanks to Notre Dame (which is holding a mass today to celebrate Hesburgh’s centenary), The New York Times, Encyclopedia.com, Encyclopædia Britannica and The Catholic World Report. In their first year of retirement, 1987-1988, Hesburgh and Ned Joyce went on various excursions to all parts of the world, including South America, Asia and Antartica. 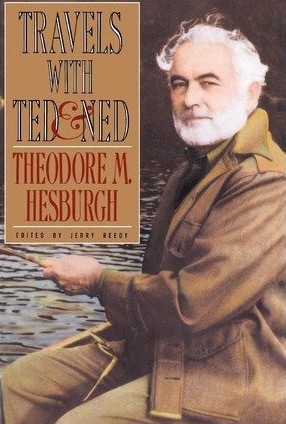 Hesburgh kept a detailed diary of their journeys, which was then published by Doubleday in 1992 as Travels with Ted & Ned. Ted opens his introduction to the diary as follows: ‘This is obviously a book about travel and two seventy-year-old Holy Cross priests who did the traveling. It was the way we chose to begin our retirement after working together for thirty-five years as president and executive vice president of the University of Notre Dame. Our friends call us Ted and Ned.’ And he concludes it with this: ‘This book, therefore, isn’t just about travel, as much fun as travel can be. Fundamentally it’s a book about totally changing one’s ordinary, lifelong way of living without coming apart at the seams. It’s a book about enjoying, not dreading retirement. And yes, it’s about stopping - stopping, at long last, to smell the roses. We’ve done just that.’ A few pages can be previewed at Amazon. As travel diaries go, it’s not the most scintillating of reads, rather mundane in fact (and Coca-Cola heavy! ), as the following extracts reveal. ‘Rio de Janeiro, Brazil. We had a wake-up call at 5:30 this morning for those who wanted to see the Rio harbor from afar. I got up for it, but it was too foggy and I took one look and went back to bed. We landed here about 7:30 and were finally off the ship at nine o’clock. Gustavo de Sá, a fine young fellow who’s Coca-Cola’s public relations man in Rio, smoothed our way through customs and delivered us to the Othon Hotel on Copacabana beach. Our rooms, one atop the other on the eighth and ninth floors, have a magnificent panoramic view - Corcovado, the mountain with the famous statue of Christ the Savior on its top, plus the whole bay and the beach. Our main activity today was nailing down all the reservations we’re going to need between now and December 6, the day we return to the United States. It was no easy task, even though we knew, generally, where we wanted to be and when. Because of a strike, all the computers at the airport were down. Fortunately, the travel department at Coca-Cola came through for us - as they have done several times before. Once we had the nitty gritty travel details out of the way, I went out to buy a topaz for my ever-faithful secretary, Helen Hosinski, who will have to type all of these notes. Again, thanks to Coca-Cola, I not only found a fine stone at a third of the price it would cost in the states, but at a 25 percent discount as well. As you probably know, Brazil leads the world in the production of semiprecious gemstones. Rio looks a lot better than it did when I was here several years ago with the Chase Manhattan Bank board. Yet the country is in terrible financial shape and the most familiar gripe is about the economy. Somehow, though, most people on the street appear to be happy. It probably has something to do with the customary upbeat attitude of the people who live in Rio. They call themselves Cariocas, which means people who put happiness and good times ahead of work and worry. We were warned repeatedly not to walk alone on the beach or to take along anything of value that could be easily snatched. The explanation was that there is so much poverty here that those who are accustomed to living by their wits are using them a little too broadly these days. Tonight we had dinner at the home of Roberto Marinho, often described as the most important person in Brazil. He’s the editor of O Globo, one of the two main newspapers in the country. In addition, he owns about sixty radio and television stations and, more important, has donated airtime to the teaching of reading and writing to illiterates. Roberto is also a member of our International Advisory Council for the Kellogg Institute of International Studies at Notre Dame. I met him for the first time a few years ago when he and I received honorary degrees from the University of Brasilia. Our young Coca-Cola friend, Gustavo, and his girlfriend, Cristiana, who works in Marinho Enterprises, were also invited to Roberto’s house for dinner. The other invitees were Father Laercio Dias de Moura, a Jesuit who is rector of the Catholic University here, and Walter Poyares and his wife, Maria Lucia. He is a professor of communications and a top adviser to Roberto. The Marinho home is almost impossible to describe. First of all, it’s high on a hill with a wonderful view of the statue of Christ the Savior. At night the view is even more spectacular, because the statue is lighted. The house is set in the middle of a primitive jungle forest with a stream running through it. Inside, the walls are hung with one of the best art collections in Brazil. ‘Rio de Janiero, Brazil. Shortly after 5:30 A.M. we celebrated our last Mass in Rio. We arrived at the airport around seven and after an hour’s delay were in Brasilia by 9:30. As usual, we were met by someone from Coca-Cola, a driver named Jonas, who spoke only Portuguese, but understood my Spanish perfectly. I told him that this was Ned’s first visit to Brasilia, and I think Jonas tried extra hard to make sure that Ned saw everything. First we went up in the TV tower in the middle of town so that Ned could get a look at the whole government setup, which runs on north-south and east-west axes. Once we had grasped the layout, we did a quick drive-by tour of all the main buildings. These included the cathedral, the Senate, the House of Deputies, all sixteen ministries, the Supreme Court, the Presidential Palace, and, later on, the president’s residence. The city has grown a great deal since I was last here. It now has about 1.2 million inhabitants. That makes it much smaller than either Rio or Sao Paulo, but it must be remembered that Brazilia [sic] was carved out of the jungle from scratch. When I was here the first time more than twenty years ago, it was just a barren plain and everything was full of red dust. Today, there are lawns and flowers and greenery everywhere. Because the city was planned, it has much better buildings, housing, roads, and general organization than either Rio or Sao Paulo. The buildings were designed by Oscar Niemeyer, perhaps the most famous architect in Brazil. For lunch we had currasco [sic], a first experience for Ned. This typical Brazilian dish is a combination of pork, lamb, chicken, beef, and sausages, all barbecued. It’s served with rice and farina, a coarse flour concoction, and, of course, cold beer. I remembered the restaurant from my last visit. It had a reputation then for the best currasco [sic] in town, and it was apparent to both of us that the quality had not diminished. Ned was hooked immediately. After lunch, we made quick stops at the Coca-Cola office, the university, where we spent a few minutes with the rector, Dr. Cristovan, and the American Embassy, where we stayed just long enough to find out from the Marine guard that Notre Dame had beaten Alabama last Saturday. Then it was on to the airport for our flight to Sao Paulo, where we will stay just long enough to have a chat with Chris Lund, a Notre Dame alumnus from the States. ‘Sao Paulo, Brazil. This was our final day in Brazil. We were up at 6:30 A.M. for Mass with the family and household staff. After a continental breakfast, we dropped Chris off at the Brazilian Chamber of Commerce office, where he is president for Sao Paulo, the largest council in Brazil. Then it was on to the airport. The horrendous traffic doubled our travel time compared with the day before. Once there, we found a Miami paper and learned that we really clobbered Alabama last Saturday. This news was especially welcomed by Ned, who looked after Notre Dame athletics for all those thirty-five years he was executive vice president, and for whom the lean years of the early 1980s were still a fresh memory. Our flight to Santiago, Chile, took about four hours in a 737. At the airport, waiting to welcome us, were our good friends Father George Canepa, a Chilean Holy Cross priest, and Father Charlie Delaney, a classmate of Ned’s. Ned stayed with Charlie, who is in charge of seminarian formation here, and I moved in with George. When I arrived at the Casa Santa Maria, my billet for the stay here, I called Helen back at the office to catch up with the news. I also asked her to arrange for overcoats for Ned and me in New York, where we’ll be arriving in about three weeks with nothing but summer clothes. ‘En Route to Milford Sound. We awoke to another slightly overcast day, about 75 to 80 degrees on deck, but getting warmer. The sea is calm. There is only a slight 5-knot wind coming in from the east. We are cruising down the west coast of South Island, having come almost 500 miles since leaving Wellington last night. We’re moving along at 28.5 knots. This morning we passed Mount Cook. At about 12,000 feet, it is the highest point in New Zealand. As we made our way down the coast toward Milford Sound, the coastline was about twenty miles off our port side, very mountainous, like the coast of Chile, with some snowcapped peaks as well. Rudyard Kipling called Milford Sound the eighth wonder of the world. It was formed many millions of years ago when the sea flooded a giant glacial valley. It’s really a fjord that is dominated by a miter peak over a mile high. Pembroke Peak is even a bit higher. From these two peaks, precipitous rock walls plunge deeply into the water. The water is 180 feet deep at the entrance to the sound and 1,680 feet deep at its head. Fog descended down off the peaks, along with rain, as we approached the head of the sound. Nevertheless, we were able to make out the Milford Sound Hotel and most of the outstanding sights along the way. The scenery was quite spectacular, much like the Norwegian fjords. When we reached the middle of the fjord, we turned around and retraced our route. At 45 degrees south, Milford Sound is the farthest south we will sail on our journey across the world, although we’ll come close to this latitude as we round the bottom of Australia near Melbourne. ‘En Route to Tianjin. We woke up this morning to what was probably the worst weather we’ve experienced. The sea was full of whitecaps, the wind was strong, and the rain was pelting down as we passed offshore of Shanghai. To make matters worse, there was fog in all directions, so we couldn’t see anything. Played bridge for an hour and a half this afternoon, and for a change Ernie and I beat Ned and Faye. I can’t claim it as a great victory, though, because in over 4,000 points scored on both sides, we won by only 30.